Just came back for a tw0-day, one-night trip to Sumatakyo Hotsprings at the foot of the Southern Alps in Northern Shizuoka Prefecture. We took our last train from Kanaya Oi River Railway Station (private railway) and bought our ekiben (railway Station Lunch boxes) there before boarding the diesel train (we took the steam locomotive on the way back). A series of three articles are coming soon to describe that trip in detail! 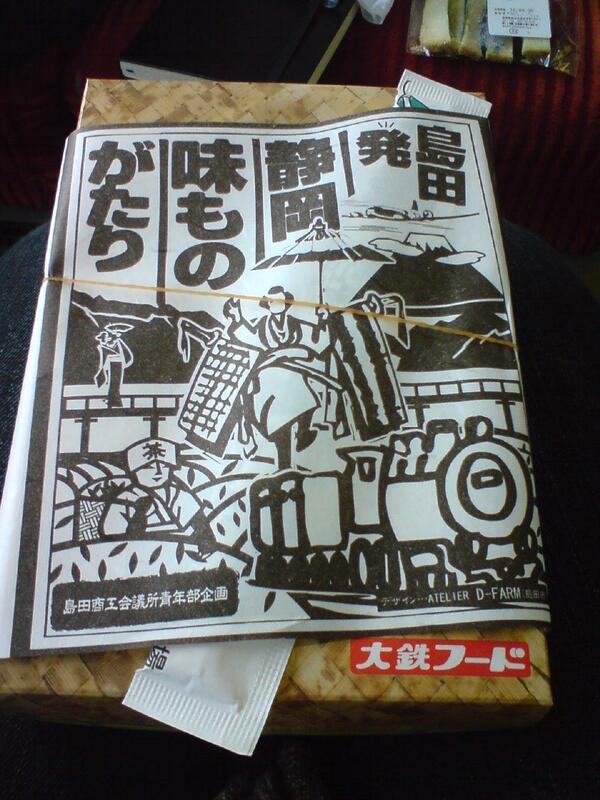 The bento I chose was called “Oikawa Furusuato Bento/Oi River Hometown Bento” and was commemorating the C11 SL. It included Sato Imo/taro on a stick with sweet miso sauce, Tamahoyaki, Takenoko/bamboo shoot, Fried and sweetened Sakura ebi/Cherry shrimps, Gobo/Burdock root, Chicken Karaage/Deep-fried Chicken, yama imo/yam seasoned with umeboshi/Japanese pickled plums and amazu/sweet rice vinegar, Yamame trout (Japanese trout) and two nigiri wrapped in seaweed. 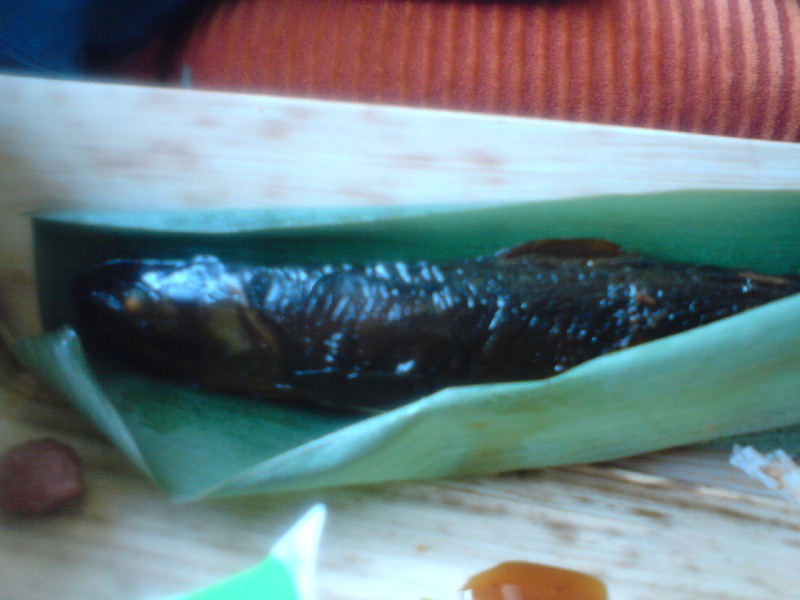 The Yamame trout had been simmered for a long time in soy sauce, mirin and sugar. The whole was edible, head, tail and bones included! 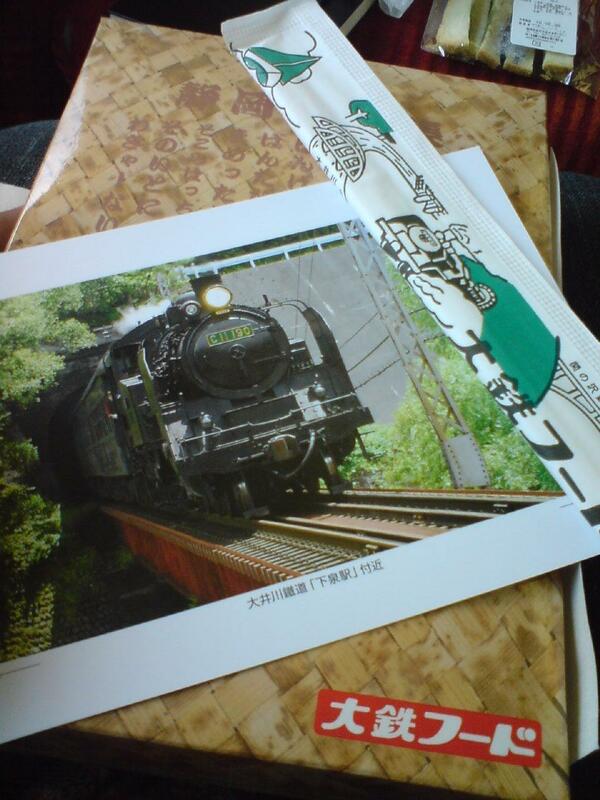 The bento included a complimentary postcard of the SL locomotive and chopsticks in original paper wrapping. Even the soy sauce was included inside an SL-shaped tube! 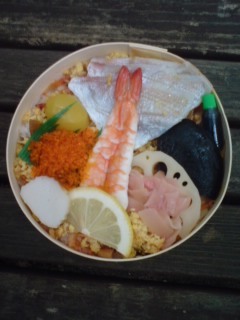 The Missus chose the “Shimada Hatsu Shizuoka Aji Monogatari Bento/Shimada Start Shizuoka Taste Story Bento”. It is the second time she had it but the contents were slightly different from last year. Th saber-dancing samurai is a figure of a very famous matsuri/festivaltaking place every 3 years in Shimada City where Kanaya is located! It contained a Sakura ebi nigiri, Unagi Nori Maki/Ell sushi roll, Wasabituke/wasabi plants pickled in sake white lees in its little container, Tea tempura, Menchi Katsu/Minced pork croquettes, Kuro Hanpen/Sardine paste, Take no ko and sato imo (nimono/stewed, kamaboko/fish paste “flower”, lychee and mikan! And we had cold tea from Kawane (the region covering the area between Kanaya and the Southern Japanese Alps, one of the best tea areas inJapan!) to wash it down! Just came back from University where I had to rush to “help” a stident re-take and pass his Summer Finals. As I had no time to stay long enough at home for the Missus to prepare a packed lunch, I just sped off (on my bicycle) to Shizuoka Station where I purchas an Ekiben/Railway Station Lunch Box. Knowing the Missus, I suspect she gorged herself with pasta for lunch at home! I chose that particular Ekiben because it was seasonal. You never know after all, as this could prove to be a unique occasion. Its name was very poetic: 秋千扇/Aki Chi Sen=The One Thousands fans of Autumn! As I mentioned before hygiene laws for bento in Japan are very strict and contents are cleraly indicated (in Jpanaese) on the box with the packaging date and time and price. This particular one cost 1,000 yen/about 11 US $ at the current rate. As usual the food inside is protected by an sheet of hard cellophen paper. The “gohan/rice” part was rice steamed with shiitake mushrooms slices and pieces of chestnuts, a very popular way to make “mazegohan/mixed rice” inthe Fall/Autumn. The juices of the shiitake are incoprated in the rice, making even more tasty. The garnish consisted of boiled or simered vegetables including burdock root, carrot, shiitake mushrooms, sato-imo/tuber variety (very soft), string bean and devil’s tongue tuber/Konnyaku. Dessert consisted of goma dango, a ball of mochi containing anko and coated with white sesame, and a slice of kiwi fruit. Above the dessert a slice of fried salmon made up for the meat part. The other half of the garnish consisted of seaweed/wakame and cucumber salad seasoned with amazu/sweet vinegar, deep-fried and sweetened sakura ebi/cherry shrimps (found only in Shizuoka). Above them Deep-fried chicken in sweet and sour sauce with beans an a small “cup” od wasabi zuke/wasabi pickled in sake lees to season the rice with, not forgetting the small tube of soy sauce for the veg! Today both the Missus were in a bit of a hurry and working early, so she did not have the time to prepare a lunch box/bento as every Monday. The Shizuoka JR Station not being far from my work place, I visited it at 9:45 a.m. when “freshly prepared” ekiben/Railway Station Bento” arrive at the booth inside this major station. As Frank told me some time ago, there is no comparison with what is on offer in Amtrak Stations in the US. I am certain there is a new business opprtunity there! 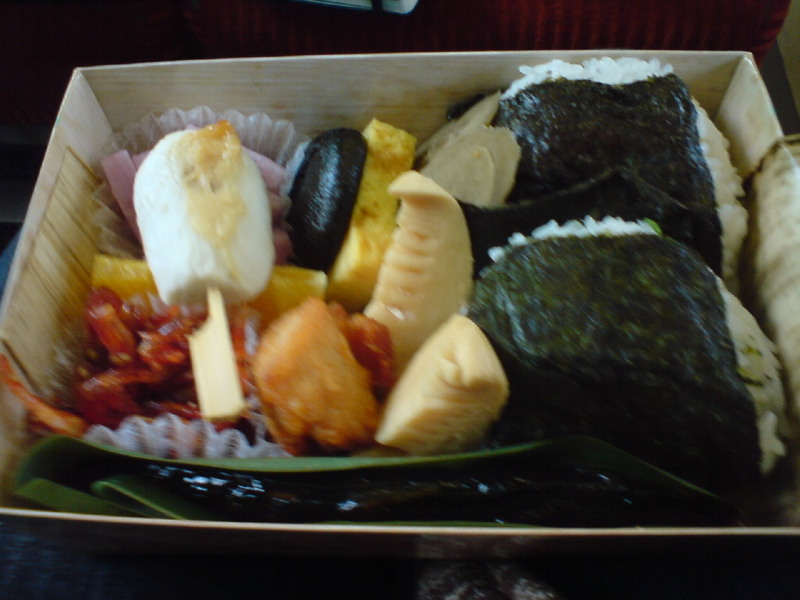 These bento purchased at railway stations are completely safe as Japanese rules and regulations are extremely stringent. All the contents are clearly written and a sticker will tell the exact time when usold lunches/dinners will be collected and discarded! The box will always be accompanied by a pair of disposable chopsticks, so don’t worry about carrying any! This partiular lunch box is called “Shizuoka Monogatari/Shizuoka Story” and contains mainly products from Shizuoka Prefecture. Upon opening the box, you will discover a hard cellophane paper protecting the food inside. 2) Spaghetti (for Italian tourists?). The Japanese are simply crazy about them! 4) Shuumai, soy sauce mini bottle, and apricots (for dessert). 5) Grilled saba/mackerel and sweet beans. 6) Steamed vegetables: Carrot, renkon/lotus roots, takenoko/bamboo shoots and string bean. 7) Daikon pickled in amazu/sweet vinegar and tamagoyaki/ Japanese omelette. 8) Two products from Shizuoka: kuro hanpen/sardine paste and sweet maguro dices. 9) Another product from Shizuoka: Unagi/broiled eel with some lettuce and pickled ginger. The price: 9 US $! Very good value for a healthy and complete meal! 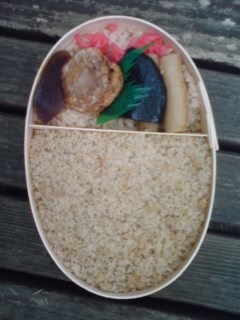 As I mentioned before, “Ekiben” is the abreviation for “Eki”/Railway Station and “Ben”/Bento-Lunch box. These packed lunches are extremely popular in Japan (I counted more than 90 in Shizuoka Prefecture alone!). 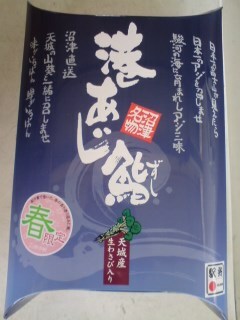 This particular one is served in Shimada City Railway Stations of Shimada and Kanaya. Shimada City is famous for its green tea, Japanese sake, Festival and new airport! 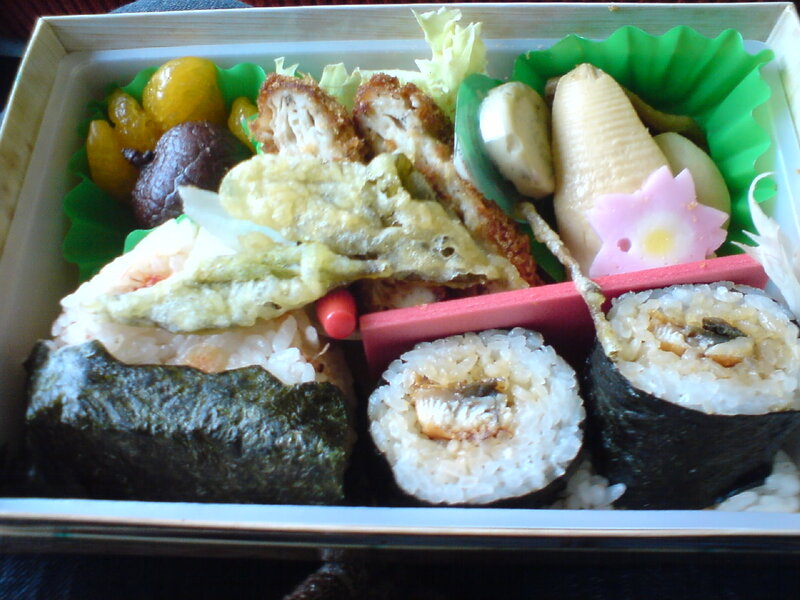 The rice/gohan part is made up seaweed maki/roll (top). A little lettuce and more rice in the middle with a tea leaf tempura. Bottom half left cosists of boiled/simmered bamboo shoot, kamaboko/steamed fish paste and kuro hanpen/sardine paste. Note the small capsule of wasabi-zuke/wasabi pickles to be eaten with the rice. Bottom middle consists of “tonkatsu/deep-fried pork fillets with their small tube of soy sauce. For dessert lychee and small mandarine orange! 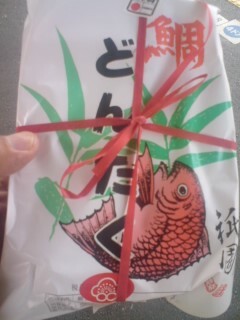 “Ekiben” is the abreviation for “Eki”/Railway Station and “Ben”/Bento-Lunch box. These packed lunches are extremely popular in Japan (I counted more than 90 in Shizuoka Prefecture alone! ), as not only they make for a very satisfying lunch during a long trip, but they are usually made up with local ingredients, thus offering a good idea of what is eaten in the particular region you are visiting or going through! I bought this one (the Missus’ in the next posting!) at Shin Nakaya Station, the station where the Oigawa Railraod Steam Locomotive starts from to Sensu Hot Springs. 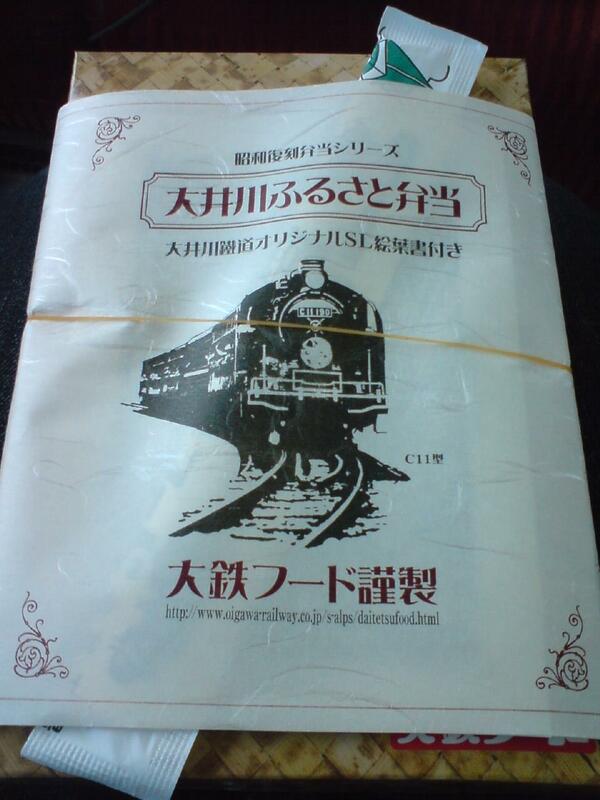 There are very few steam locomotives left in Japan. Therefore this private railway line and station lunch boxes are pretty out of the ordinary. 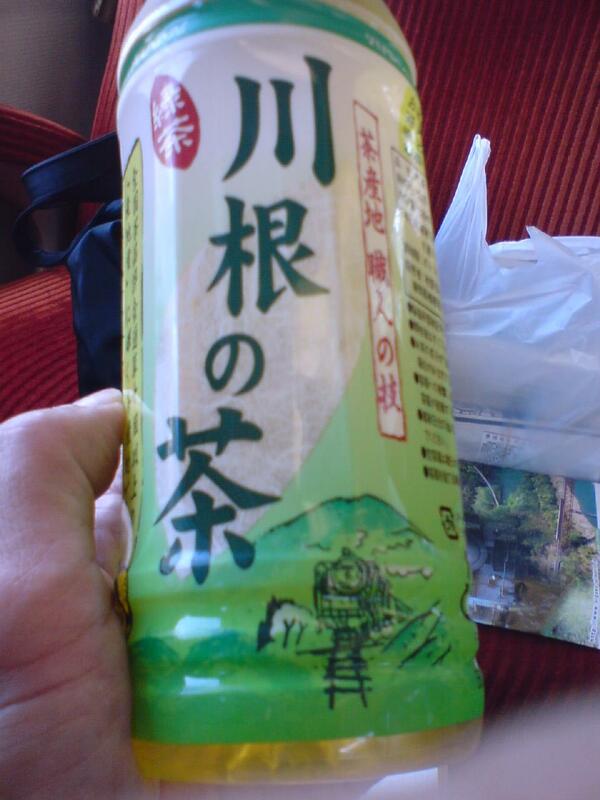 Also note the can of Shizuoka Tea (Shizuoka produces 50% of all green tea in Japan! 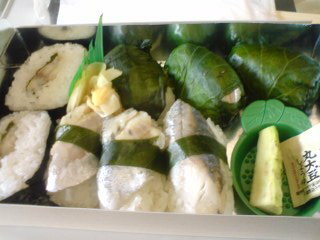 The steamed rice was mixed with pickled wasabi leaves. Bottom right are simmered burdock (gobo) roots, wakame seaweed, boiled sato imo/tuber, green pepper, boiled bamboo shoot and some decorative tidbit. Deep-fried meat featured shrimp, kuro hanpen/”black” sardine paste and minced chicken balls with sesame seeds, shuumai/dim sung and lettuce. 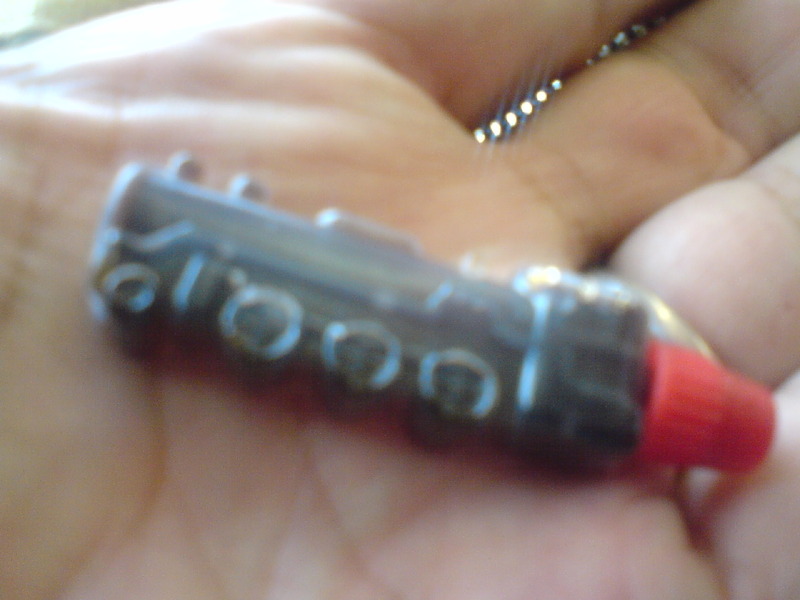 Note the small train-shaped soy sauce tube! Pickled daikon and cucumber in the middle. Top left are pieces of konnyaku/devil7s tongue tuber jelly, tamagoyaki, kamamaboko/fish paste, sweet pickled sakura shrimp and a small cup of wasabizuke/pickled wasabi in sake lees to eat with rice. Plenty to eat for our trip! ”Ekiben” or Railway Station Lunch Box (eki=station + ben/abbreviation for bento)in Japan and Shizuoka are a must for travellers who wish to experience real local food! Shizuoka has a higher average because of the great numbers of railway stations and access to many kinds of food and ingredients. The Missus purchased that particular one at Ito City Railway Station on October 23rd. 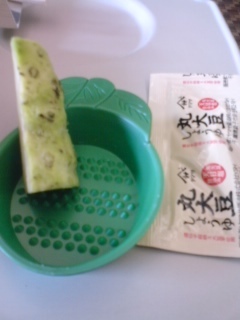 Provided with chopsticks and tooth pick, it made for a great lunch while visiting the Izu Kougen shoreline! I purchased that particular one at Ito City Railway Station on October 23rd. It is called “Tai Dontaku”. “Tai” stand for seabream or snapper, a fish abundant along the Izu Peninsula shores. The bottom halfe is steamed rice covered with powdered seabream flesh/surimi. The top half includes “hotate karaage/deep-fried scallops”, “Gobo/simmered burdock roots”, and “Shiitake/simmered shiitake mushrooms”. 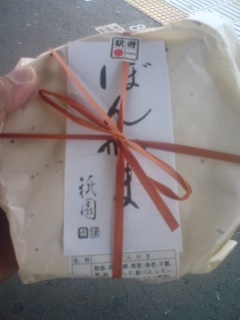 I found this limited seasonal (Spring only) ekiben at Mishima JR Station Shinkasen Platform. It is actually made in nearby Numazu City, one of the major fishing harbours in Japan (it does have a JR Station, but no Shinkasen stops there), and consists of Aji (sebream) sushi. The lunch includes three types of sushi: nigiri (a piece of fish atop a ball of rice) secured by a band of pickled cherry tree leaf, another nigiri made up of a ball of rice mixed with the same fish inside a pouch made of pickled cherry tree leaf and a sushi maki also envelopped in pickled cherry tree leaf instead of the usual “nori”/seaweed. The fish is caught and pickled in Numazu City, therefore absolutely safe for consumption. The beauty is that we are provided with a piece of real fresh Wasabi (from Amagi Plateau in Izu Peninsula) with a grater and soy sauce! 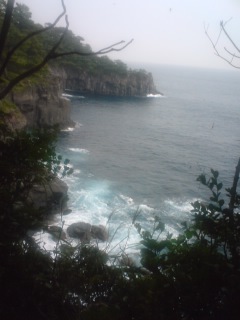 You could not find something more typical of Shizuoka Prefecture! are these box disposable ??? some looks like just cardboard, but some looks like bamboo or plastic ??? i wander where i can find the boxes and buy them ??? do you know if they are available in japan ??? No, these boxes are cetainly not disposable. They are made of really high-quality wood! I’m sure they are availabe on the Internet! I just found your site-I just love it- I love the culture and the photos, and of course, the food. I am saving you- I can’t wait to have a bit more time to really poke around here and read, thank you so much for this site. The pleasure is all mine,my friend! I live in Fujieda and often go to Shizoka, so I found your blog very interesting with lots of food in Shizuoka. About the way to make pre-salted boiled eggs, I’ve heard they make them by leaving boiled eggs in satulated saline overnight. Your remark about boiled eggs holds true! Actually, pre-salting them is a way to preserve them as you that eggs can be dodgy in hot weather. They just boil them in heavily salted water as the shells of eggs are porous and some of the salt will find its way inside!